Menotti’s Coffee Bar is a killer establishment; hip, simple, straight-forward, no bells and whistles coffee. 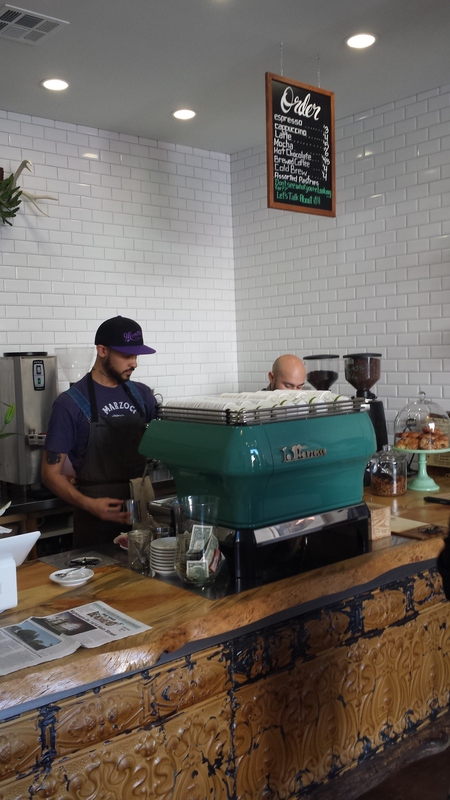 Located near the busy Venice Beach walk, it serves up coffee literally right off the beach. Want a quality cup after a nice stroll, skate session, or dip in the pond? Well, now you’ve got a spot! The store is designed with a simple color scheme and antique flair, putting all the emphasis on the two wooden standing bars on either side of the store and the coffee bar at the center. If I were to design a shop, this is definitely a to emulate; simply, we don’t have enough standing bars in the US! Those who have gone to cafes in Italy know what I am talking about. But more than that, it is all a very deliberate process; the parts of the store that need emphasis get it, the parts that don’t require it don’t, and what you get is an intimate experience with coffee as the centerpiece of it all. Both in motif and atmosphere, the bar is relaxed with a professional presence. For those who want to sit and converse with friends for long periods of time or do a little studying, this is not the place for you. If, however, you want to watch some skilled coffee production, chat with a friend over a drink before carrying on with your day, or just need a quick (but high quality) pick me up, this place has your name on it. 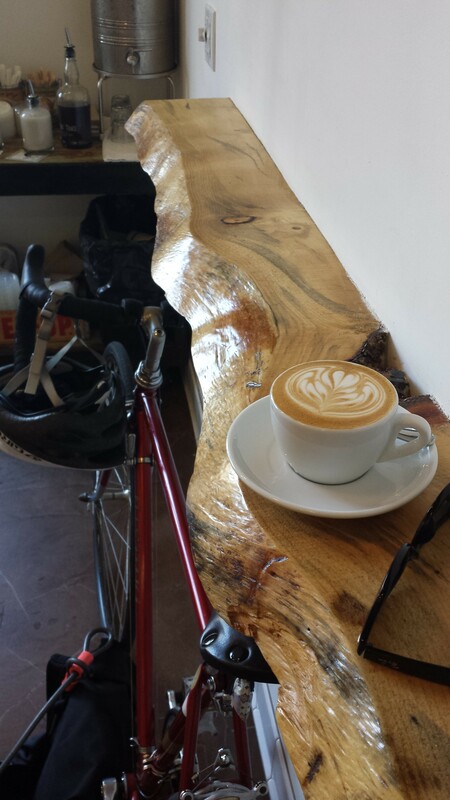 Menotti’s brews Four Barrel coffee with distinction. The usual suspects are on the menu and these guys aren’t wasting their time on crazy inventions. Call it drab or trite, I think for some, the principle “if it ain’t broke don’t fix it” applies quite adequately. My cap was nothing short of outstanding, all elements were top notch. The art was phenomenal and the most inviting aspect, definitely taking the standard Rosetta/tulip routine to the next level. Sure, but art doesn’t mean it tastes good… or does it? Read my colleague Kyle’s post about “tasting with our eyes” (also featured on this site); art says a lot about texture and predispositions. Of course, the flavor did not disappoint; the milk to espresso ratio was perfect, the espresso flavor was distinctive, mild rather than heavy without being unpleasant, chocolatey, and robust without being overwhelming. The milk texture was eqaully impressive and velvety. Definitely can roll with the best shops in town. 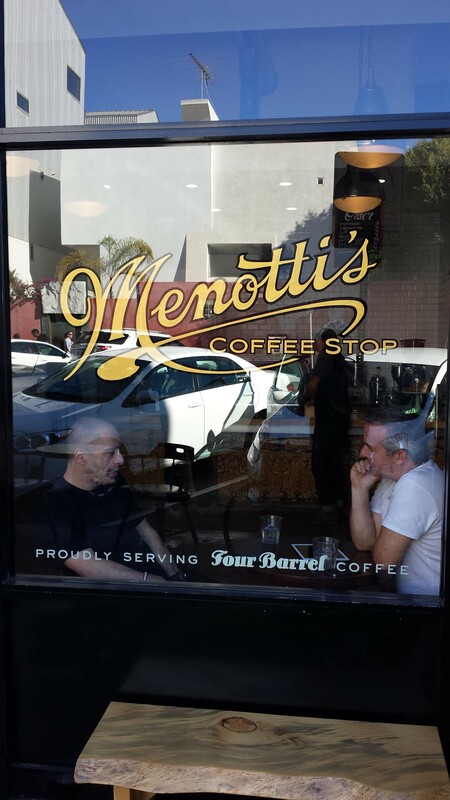 Overall, Menotti’s coffee bar is a gem tucked away in the busy Venice Beach area, offering high quality coffee and an understated experience for the casual drinker and the coffee aficionado.